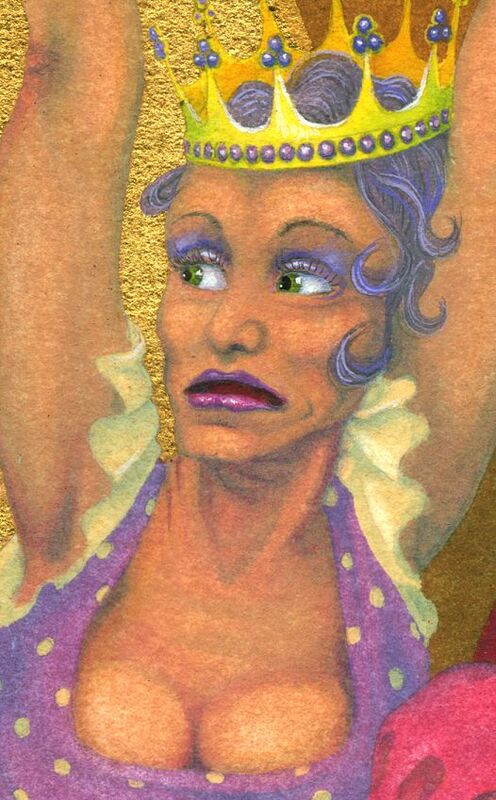 Artwork details: gouache, with 24k gold leaf, 16.2 x 10.8 inches (41 x 27 cm), 2011. 19th July 2011: back at the start of this year, there was much talk about royal weddings. Rather a fine subject for a painting, I thought, with my own twist to just such an event. Unfortunately, the painting was rather late in coming and missed the big day by a couple of months and more. I had in fact worked out the whole composition and intended it as an etching, the strong diagonal of the princess' wedding gown in white was to be the basis for a striking monochrome picture. But then I became more interested in the faces and expressions of all the (rather belligerent) wedding guests, and I didn't think an aluminium etching was really going to bring out all the details. So, delayed, the drawing sat in a sketchbook for some months before I got round to painting it, and in the end the complexity of this composition was much better suited as a painting. 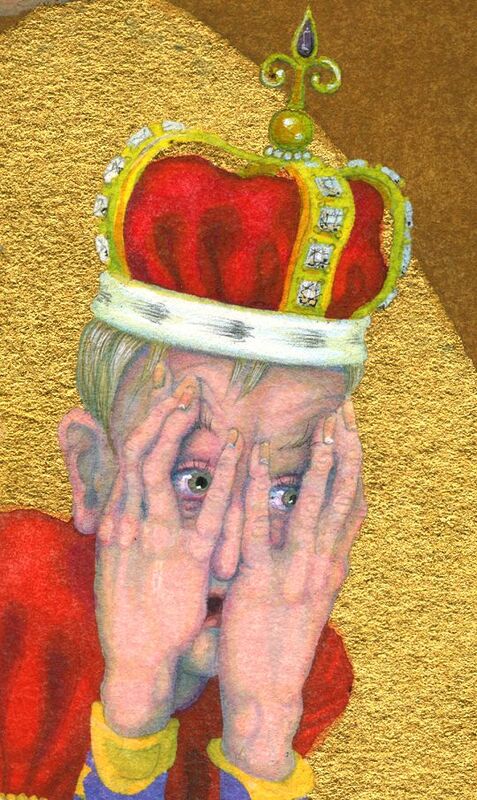 The colour and the gold leaf suit the royal subject rather well too. 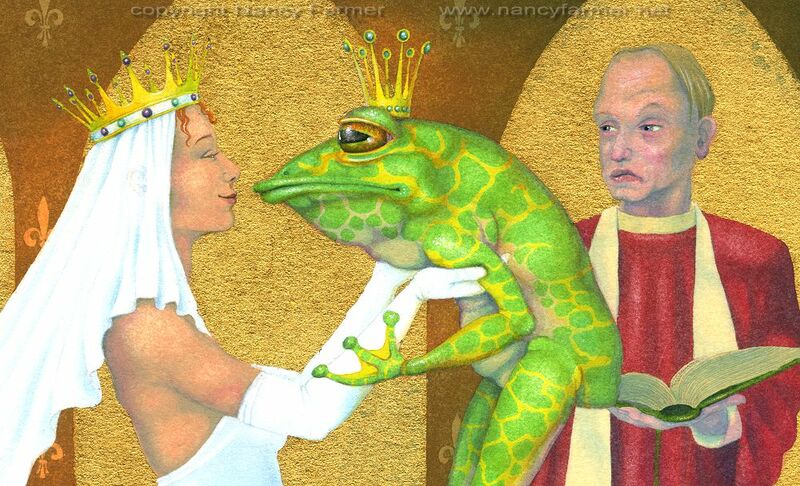 This is the third painting I have completed of the Princess and her Frog, and it seemed high time she should make an honest frog of him. Of course, it is also possible that it was the frog who croaked the question, but I think not. It's the princess, I suspect, who wears the trousers in this relationship. 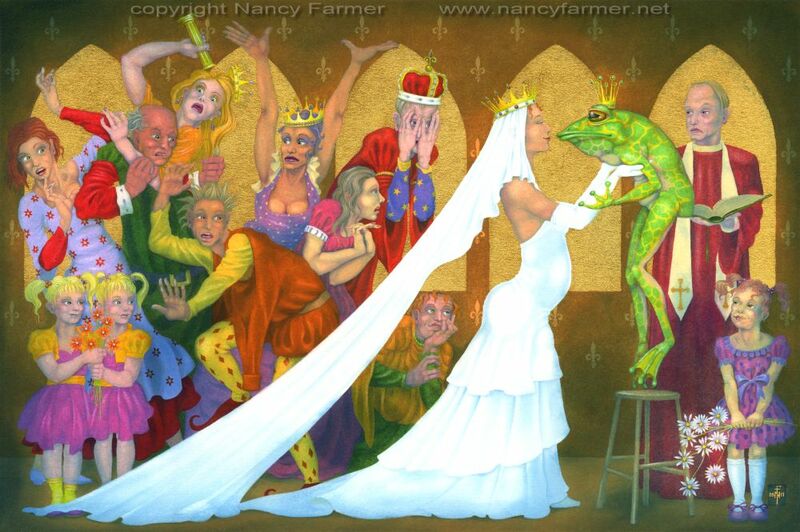 The princess in my paintings has always been rather happy with her frog, despite the feelings of friends and relatives. Frogs are much more interesting than princes. 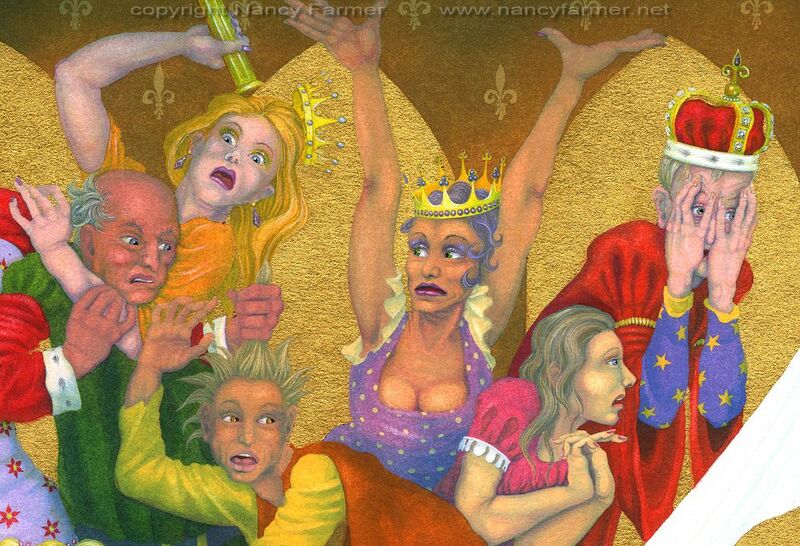 I had particular fun with the faces in this painting. The queen is a woman of 'a certain age' and clearly believes that youth can be maintained by the application of more and more make-up. The two details above and below are greatly magnified from the original size of the painting.